There's little doubt that a lot of software these days is produced with the 'less experienced' user in mind. In broad terms, that can mean anything from Millennium Bug-style scaremongering, to 'protect your children' scaremongering, to 'buy this or your PC will break' scaremongering. 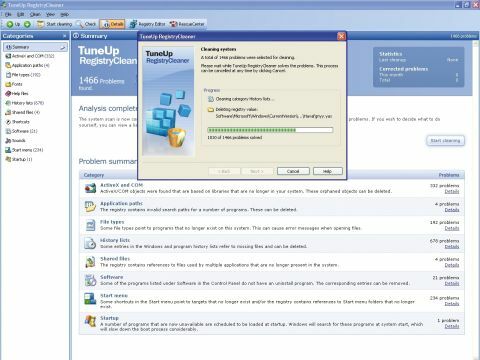 TuneUp Utilities 2006 fits somewhere in this market, but it's by no means the sole offender. The reality is that people will always be taken in by the word of an 'expert'. That's true of many things: buying a car, a TV, a PC, even maintaining a PC. Our risk-obsessed culture makes it a priority to eliminate every possible flaw or risk, no matter how remote it is. Where there's blame, there may be a claim; so where there's a risk, buy a disc. That's not to say that software such as this, or an alternative like Iolo's System Mechanic 6 is useless. Not at all - this is a comprehensive collection of tools that covers a myriad ways to enhance your computing experience. You can alter the aesthetics - like you can with Tweak XP - or edit and clean the registry, as well as performing tasks like secure file deleting, network speed-up and browser tweaking. These tasks are performed by individual utilities housed within a well presented framework. The problem is that many freeware tools designed to do similar jobs as this software are available. And if it's a job that you see as important, it's likely that you already have those tools anyway. Group them together in the same Programs folder and you can get most of the tools provided by TuneUp Utilities for nothing more than the cost of some time spent surfing and downloading.